Following Apple's lead in banning cryptocurrency mining apps, Google has also updated its Play Store policy this week to ban apps that mine cryptocurrencies on users' devices in the background. However, there are countless cryptocurrency mining apps, including MinerGate, AA Miner, NeoNeonMiner, and Crypto Miner, still available on the Play Store. Cryptocurrency mining is not a new concept, but the technology has recently been abused in the past year after hackers found it a great way to make millions of dollars by hijacking PCs to secretly mine cryptocurrency in the background without their users' knowledge or consent. Due to this practice, cryptocurrency mining has emerged as one of the biggest threats, raising negative sentiments towards this alternative revenue scheme, and big tech giants like Apple and Google took strict measures to put restrictions on such apps. Over a month ago, Apple updated its App Store guidelines to ban cryptocurrency mining apps and advertisements from its App Store, and now the same has followed by Google. Google has updated its Play Store Developer Policy to explicitly ban several more categories of Android apps, including those that utilize a device's CPU for mining cryptocurrencies. However, "apps that remotely manage the mining of cryptocurrency" are not included in the ban. Apps that serve distracting ads to users after each tap. Apps that misrepresent or conceal their ownership or primary purpose. Apps that sexualize minors, or are designed to appeal to children but include adult content. Apps that distribute "content with child sexual abuse imagery." Apps that "facilitate the sale of explosives, firearms, ammunition, or certain firearms accessories." Apps that promote hate speech, violence, self-harm, discrimination based on various factors such as sexual orientation or gender. This is the latest improvement in a series of crackdowns on cryptocurrency mining apps or ads enforced by major tech companies. 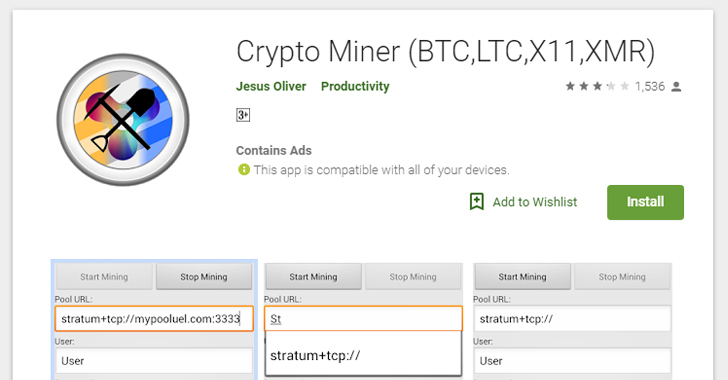 Last month, Google banned cryptocurrency mining extensions from its Chrome Web store to prevent cryptojacking by malicious extensions that mine digital currencies without users' knowledge. The tech giant also started restricting advertisements that promoted initial coin offerings (ICOs), cryptocurrency wallets, cryptocurrency exchanges, and cryptocurrency trading advice. Earlier this year, Facebook also banned all ads promoting cryptocurrencies, including Bitcoin and initial coin offerings (ICOs). In late March, Twitter also announced its plan to block cryptocurrency-related ads on its platform.